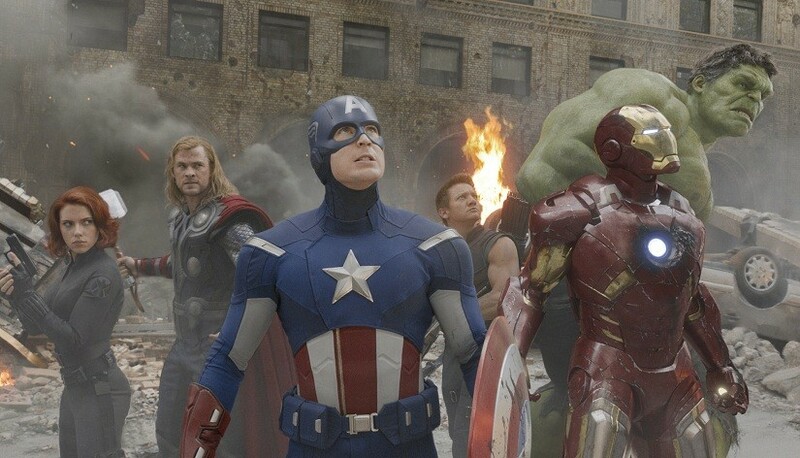 The Avengers assemble during a New York battle. Marvel’s fans, particularly those of the die-hard comic-book variety, are a patient bunch. For 4 years, they watched and waited in nervous anticipation as the studio baited them with post-credit teasers that worked to slowly draw together the characters from five different superhero box-office successes. Marvel’s build-up to The Avengers was the most drawn-out in Hollywood history; since 2008’s Iron Man, through 2011’s Captain America: The First Avenger, Marvel was slowly putting the pieces together for one colossal blockbuster. The hype around it was massive, perhaps more than any other film ever made. And it fell to Joss Whedon, a relative unknown to mainstream audiences, to make a film a capable of living up to it. Whedon, a geek god thanks to Buffy the Vampire Slayer, Firefly, Serenity and Dollhouse, had never even been near a movie of this magnitude before. The Avengers begins with a bang, as eye-patch-wearing super-spy Nick Fury (Samuel L. Jackson, finally in a substantial role after being delegated to second-long post-credit teasers for far too long) barely escapes a top-secret SHIELD (Strategic Homeland Intervention, Enforcement and Logistics Division) base being brought down, in true blockbuster fashion, by the diabolical Norse god of mischief Loki (Tom Hiddleston), who has returned to wreak havoc on Earth after being chased off by his brother Thor last year in the latter’s stand-alone film. Unfortunately, the movie has no choice but to reel it back a bit after the opening, as the superheroes are introduced. Among the freaks of nature Fury attempts to pair together in order to stop Loki from destroying the world are WWII-era super-soldier Captain America (Chris Evans), re-awakened after 70 years on ice, the beautiful, deadly and and aptly-named femme fatale Black Widow (Scarlett Johansson) and good-natured scientist Bruce Banner (Mark Ruffalo), who has an unfortunate tendency to destroy everything around him as the monstrous Hulk when angered. So many characters need time to develop, and Whedon knows that, taking the time to flesh them all out suitably. As the superheroes come together, it soon becomes evident that the biggest threat to the team is not Loki; rather, it’s their own lone-wolf tendencies and inflated egos. Some of the better scenes in the movie involve the heroes clashing with each other; a forest-set brawl between Iron Man, Thor and Captain America results in the utter destruction of the forest itself, while a thrilling sequence taking place aboard a massive airborne SHIELD base sees Black Widow fleeing a vengeful Hulk. Ultimately, the Avengers find their way to New York City, where a massive battle ensues between the six teammates and an army of aliens called the Chitauri led by Loki. The effects are Oscar-worthy, and the action seamlessly follows all of the characters as they work to evacuate innocent New Yorkers and repel the invaders. In spite of this, however, the finale is the movie’s weakest link. As the robotic space-ships ravage the city, there is an unmistakably Transformers-esque vibe; the aliens are expendable unknowns and the film does nothing to change that. What saves the scene is that, unlike Transformers, this team of heroes is endlessly entertaining to watch, whether it’s the Hulk doing some good old-fashioned smashing or Hawkeye shooting arrows from the rooftops with enough accuracy to make Robin Hood blush. It’s no wonder that, when the camera pans across all of the heroes preparing for battle in the middle of the war-torn city (the money-shot to end all money-shots), the audience erupted into cheering and applause. As far as the acting is concerned, there isn’t a mediocre performance in the bunch. Chris Evans is believable and winning as the idealistic fish out of water Captain, Robert Downey Jr. plays Stark with his trademark blend of panache and smarmy irreverence and Mark Ruffalo is the best Hulk yet, playing Banner as a funny, bashful guy willing to acknowledge and sometimes even accept “the other guy.” Tom Hiddleston makes for a great villain, playing Loki with a snakelike malevolence and psychotic charm that was sorely lacking the last time he played the character. Even Scarlett Johansson, whose character is required to do little other than look sultry, is charismatic enough to warrant a Black Widow spin-off, which I have no doubt will eventually happen. This entry was posted in Reviews and tagged 2012, avengers, marvel, review, superhero. Bookmark the permalink.